To start 2018 afresh, we removed both the Lucero LFN200 and La Patrie’s Motif from this chart, replacing them with two excellent electro-acoustics that come in at under $500: the slim Cordoba C5-CET Thinline and the very appealing Yamaha CGX122MSC. 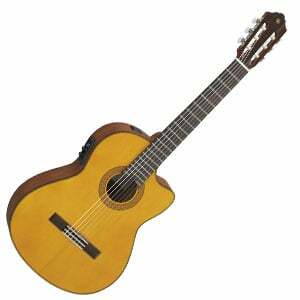 With $500 in your pocket the classical guitar world really is your oyster! While you’re still a few hundred dollars off the true premium market, in this category things are starting to feel more high-end. 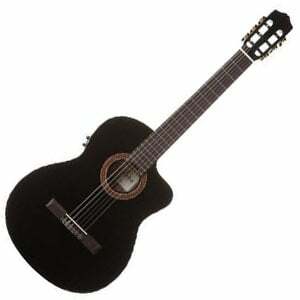 What to Look for in a Classical Guitar Under $500? Woods get better, playability increases, and electronics – when included – are more advanced. You can find yourself with a performance-worthy instrument that could last a lifetime, if looked after. On this page, we’ve searched through the current classical guitar market to produce a short chart that represents some of the best choices, whatever your style. Whether a keen flamenco player, classical maestro, or an electric guitarist making the move to classical guitar, there’s likely to be a model to suit you. 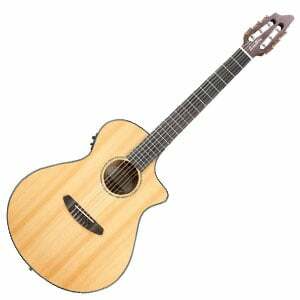 An all-round solid electro-acoustic performer from Yamaha. A gorgeous thinline performer from Cordoba. Great sound and stability from the respected Bulgarian brand. A delightfully unique electro-acoustic classical with USB connectivity. Yamaha make a very well-deserved appearance in this chart thanks to their excellent CGX122MSC, which blends great playability, pro-level amplification and solid wood into one all-round affordable model. With a traditional style, this model sports a solid Engelmann spruce top along with sturdy laminated nato back and sides. There’s a sleek nato neck, rosewood fretboard and 19 frets, which are all easily accessible through the 12th fret cutaway on the treble side. Another highlight is the Yamaha-designed System 61 preamp and A.R.T. two-way pickup system, which amplifies the guitar’s rich tone naturally, while offering plenty in the way of sound shaping through the onboard control panel. More on the Yamaha CGX122MSC can be found in the full review . As we highlight in the full review of Cordoba’s C5-CET, this modern nylon-stringed guitar offers all the warmth and richness that a mid-range, solid top Cordoba would usually deliver, but with a sleeker thinline design and slim neck that will appeal to players of all genres. Available in both glossy jet-black and natural wood varieties, the C5-CET is crafted from laminated mahogany, with a solid Canadian cedar top, and bound with rosewood. The quality wood stretches into the slim mahogany neck, where a cutaway provides good access to the highest of the 18 frets. This electro-acoustic is fitted with a popular Fishman Isys+ system, with simple but effective EQ controls and an onboard tuner for easy tuning on stage. The Kremona Soloist S65C is the full-sized version of the companies Fractionals. There are six models that make up this series ranging from 440mm to 650mm scale lengths. They all use the same components and woods to create a line of guitars that can literally grow as young players grow-up. The top is cedar with sapele back and sides. The neck is mahogany with a rosewood fingerboard. The bridge is also made of rosewood. 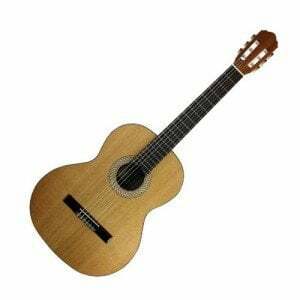 The wood purfling and rosette makes this a very good looking classical guitar. The sound projects well with very good treble and a sharp low-end that does not disappear in the mix. It also includes a gig bag so the S65C can travel to lessons unscathed. This unique electro-acoustic classical model is part of Breedlove’s Pursuit Series, which is geared towards performing players and – thanks to the addition of USB connectivity – those experimenting with recording. It breaks the mold a little with its design, which includes a generous single-cutaway, tortoiseshell binding, and that distinctive Breedlove headstock. However, it sounds very much like a traditional nylon stringed guitar, thanks to its solid cedar top and laminate mahogany back and sides, offering a warm and mellow tone. As we mention in the full review of the Breedlove Pursuit Nylon, this model features a slimmer nut width and a radiused fretboard, meaning it’s well-suited to steel-string players looking to add a nylon-string guitar to their collection. The second Cordoba model on this chart is the C7, which offers beautiful traditional style and quality woods, although no electronics as with the C5-CET above. As we highlight in the full review of the Cordoba C7, this lovely guitar features a solid European spruce top, with the back and sides made of Indian rosewood. The body feels well-crafted for the sub-$500 price tag – a feeling of quality that stretches into the mahogany neck, which offers a rosewood fretboard and 19 frets. Hardware is decent, while the tone is warm but satisfyingly crisp – a real pleasure to hear. For both beginners and advanced players, the C7 is a worthy contender for your cash. Tradition is a word we use a lot when talking about classical guitars, but there’s a reason. Whether you’re purchasing a classical guitar worth $100 or $1,000, they all demonstrate traditional features that are rarely tinkered with – wide necks and slotted headstocks for example. However, as we approach the higher end of affordable, the guitars in this $500 price range should all justify their substantial price tags by showing good quality as standard – not the exception. Naturally, the materials, construction, and electronics will differ from manufacturer to manufacturer, but general design tends not to stray too far from the norm. 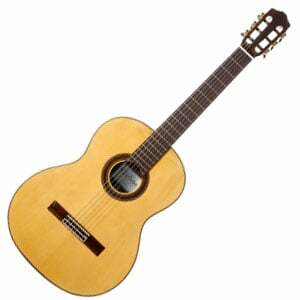 As a classical instrument, the majority of classical guitars will still show the traditional non-cutaway design, although cutaway versions are readily available for those players who explore the highest registers. Some brands also add elegant binding and adventurous rosettes to their models, which nod to the fact that these are instruments of higher quality and craftsmanship than the entry-level market. While cedar, spruce, mahogany and rosewood all still dominate, these woods will be slightly better quality in this mid-level range, and a solid top is now a necessary inclusion, although laminated back and sides are still standard. Electronics on these guitars also tend to be slightly more advanced, with systems including more versatile preamps – 3-band EQ as standard, with phase switches and built-in digital tuners. This all results in a guitar worthy of recording or stage performances, whether miking up or plugging directly into an amp. Ultimately, guitars in this range offer guitarists a taste of premium, and an instrument they want to look after, and pick up and play again and again. You can certainly pick up a bargain when buying a used guitar. Someone who has spent $1,000 on a Cordoba needs to get rid of it to free up cash – that’s where you step in and take it off his hands for half the price! Just like buying new, having $500 in the secondhand market will grant you a myriad of options and you can really find some bargains. Just make sure you are careful and avoid the pitfalls of pre-owned. Buy from a reputable online store or a local guitar retailer, who can offer you a guarantee and returns policy, should something go wrong or you change your mind (even in this range it happens). Avoid flea markets or garage sales, unless you can thoroughly test the guitar (though an amp if it’s an electro-acoustic) and are 100% confident it’s not faulty or – even worse – a fake! If you do have half a grand to spend on a classical guitar, then congratulations – you have access to hundreds of quality models. Whether you spend the full amount on a guitar, or a portion on a guitar and a portion on an amp, your options are endless. Be sure to keep checking back, as we often refresh our charts and something you find here this week might be in the under $300 category page next week! Martinez C58 – I have tried many but this guitar stands out for me.